When Chandler Parsons suits up for the Houston Rockets against the New Orleans Hornets/Pelicans on January 2, he’ll be doing so as a richer man than he was the game before. Why, you ask? Well, it’s one of several aspects of Parsons’s contract that are either misunderstood or simply unknown by most Rockets fans. Hence, the following is an analysis of one of the more interesting player contracts in the NBA today. 1. Parsons is not subject to rookie scale salary rules. The NBA has specific rules governing first round draft picks and the contracts they can sign, commonly referred to as rookie scale contracts. Such contracts are four-year deals, fully guaranteed for the first two years, with team options for each of the third and fourth years (each of which must be exercised almost an entire season in advance) and a right of first refusal after that. However, Parsons was not a first round pick. He was selected in the second round (the 38th overall selection) of the 2011 NBA Draft. Therefore, he is not subject to such rules. Second round picks can be signed to contracts much like any other player. Unlike first rounders, second rounders do not have any scale salary by which a team may exceed the salary cap to sign them. Most second rounders receive either a one- or a two-year deal at the league minimum salary. Such contracts are oftentimes non- or only partially guaranteed. The only ways in which a team may sign a second round pick to anything more are for that team to have either cap room or a salary cap exception (such as the Mid-Level Exception) at its disposal. 2. Parsons did not sign the same contract that Budinger got. In 2009, the Rockets signed second round draft picks Jermaine Taylor and Chase Budinger to identical four-year contracts using a portion of their Mid-Level Exception. Those contracts were structured very similarly to rookie scale contracts, with the first two years being fully guaranteed and the team holding options for the third and fourth years. The players agreed to such a structure in exchange for an increased first year salary and two guaranteed years. (There are more technical details to those contracts, but I’ll spare you those for now.) While Parsons’s contract does somewhat resemble the deals given to Taylor and Budinger, it is actually structured quite differently. In December 2011, the Rockets signed Parsons to a four-year, $3,629,500 contract (using a sliver of remaining salary cap room they had at the time). Like the Taylor and Budinger deals, Parsons agreed to bind himself to the team for four years in exchange for an increased salary in the first year ($850,000 instead of the league minimum of $473,604) and second year ($888,250 instead of the league minimum $762,195), both of which are fully guaranteed. However, Parsons seems to have had a better agent than either Taylor or Budinger. Whereas Taylor and Budinger agreed to give the Rockets team options for Years 3 and 4, Parsons and his agent negotiated for additional financial security. If the Rockets do not waive Parsons by January 1, 2013 (a highly unlikely event at this point), then Parsons’s salary for the 2013-14 season ($926,500) becomes partially guaranteed for $600,000; and if Parsons is not waived by June 30, 2013, his 2013-14 salary becomes fully guaranteed. Furthermore, if the Rockets do not waive Parsons by January 1, 2014, his salary for the 2014-15 season ($964,750) becomes partially guaranteed for $624,771 (don’t ask me how they got that figure); and if Parsons is not waived by June 30, 2014, his 2014-15 salary becomes fully guaranteed. It means that there are no options on Parsons’s contract to be exercised. It’s a straight-up four-year, partially guaranteed deal. The substantial partial guarantees also mean that it would hardly ever make financial sense for the Rockets to waive Parsons at any point during his four-year deal. When his contract expires in 2015, Parsons will be an unrestricted free agent. 1. Parsons is “stuck” on this contract until 2015. The Parsons Contract was negotiated at a time when it was not certain whether he would become a legit NBA player. At that time, this deal was quite a coup for both Parsons and his representatives. Now, however, with Parsons playing at a very high level, the contract may seem like a long-term (financial) prison sentence. 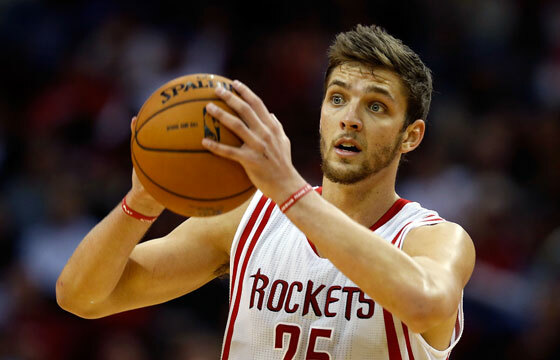 First off, there is little incentive for the Rockets to let Parsons out of his dirt-cheap deal. They have him locked up on a very favorable deal for this year and two more after that. For a team trying to manage its cap situation in order to add a second (or even third) star player, giving Parsons a raise before his contract is up in 2015 would certainly jeopardize those plans. And even if the Rockets wanted to give Parsons a raise before 2015, there really is no feasible way to do that (with one possible exception, discussed below). Since there are no option years on Parsons’s deal, there is no way to make Parsons a free agent before 2015 without waiving him. Unfortunately for the Rockets, Parsons is such a good player that there is no way he would clear waivers — other teams would be climbing over each other to get a chance to claim him off waivers. So, unless the Rockets want to give Chandler away to another team without receiving anything in exchange, they need to simply hold onto him on his current deal. 2. An extension of Parsons’s contract is (likely) not a viable alternative. Because Parsons is a veteran on a four-year deal (other than a first round draft pick on a rookie scale contract), he is technically eligible for an extension from the Rockets in 2014. Many fans have suggested that the Rockets give Parsons an extension in order to give him a substantial raise and keep him under contract beyond 2015. However, the rules governing contract extensions do not make this a financially feasible option for Parsons. Under the CBA, a player may not receive an extension giving him a raise in excess of 107.5% of his salary in the last season of the contract being extended. For Parsons, an extension would cap his 2015-16 salary at $1,037,106. I’m guessing that Parsons (and his agent) feels that he can do better than that on the open market. So, go ahead and cross the contract extension route off the list of possibilities, unless . . .
3. A contract renegotiation remains a possibility but is not in the team’s best interests. While a contract extension is not economically feasible for Parsons, there remains the possibility of a contract renegotiation with a simultaneous extension. Only teams that are under the salary cap can renegotiate player contracts. For instance, the Oklahoma City Thunder implemented this “renegotiate-and-extend” approach with Nick Collison in 2010 (you can read more about that deal here). While the 2011 CBA changed the rules about these deals to limit the decrease in salary a player could accept in the first year of his extension to 40% (making Collison’s particular contract impossible to do now), the Rockets could still position themselves to keep Parsons locked up via a simultaneous renegotiation and extension. However, this approach would seriously hamper the Rockets’ overall rebuilding strategy. First of all, the Rockets would need to be under the cap during the 2014-15 season for this to even be possible. That would mean that the team likely failed in its attempts to acquire a second star player. It also means that the team did not even use its cap room during the summer of 2014 or at the February 2014 trade deadline to otherwise improve the team. Unless Parsons has developed into a bona fide perenniel All-Star caliber player by that time, there is little incentive to jeopardize the team’s cap situation — and its continued pursuit of that second star player — for the sake of locking up a good (but not great) player. Also, even with a Collison-like contract in place, Parsons would have a relatively substantial cap figure locked in on the Rockets’ roster entering the summer of 2015, when the contracts of Jeremy Lin and Omer Asik are set to come off the books and the Rockets possibly positioned to add another significant piece to the puzzle. 4. Letting Parsons hit free agency in 2015 may help the Rockets’ cap situation. Given the possibility of the Rockets (even with the addition of another significant piece in the next three years) having substantial salary cap room in 2015, there is potentially much to be gained by letting Parsons hit unrestricted free agency. Because of Parsons’s miniscule 2014-15 salary, his cap hold on the Rockets’ books when he hits free agency until he is signed (either by the Rockets or another team) will be a paltry $1,833,025. This means that the Rockets could use all of its available cap room in 2015 — except for that $1,833,025 cap hold amount — to pursue a major free agent (such as Kevin Love, who can opt out of his contract with the Minnesota Timberwolves that summer), then later exceed the salary cap to re-sign Parsons to any amount using his Bird rights. Admittedly, this approach will involve asking Parsons and his representatives to trust in the organization to do right by Parsons once the dust settles on the team’s other summer plans. While I imagine that Parsons’s agent will certainly market his client around the league to gauge his “fair value” as a free agent, the relationship established between player and organization to date suggests that a level of trust should still be there in 2015. Barring a trade, the Houston Rockets and Chandler Parsons are stuck with each other under his current contract. An apparent victory for the player at the time of its original execution, the contract is now one of the most team-friendly in the entire league. The Rockets have Parsons locked up until 2015 for a mere pittance. That low salary (and Parsons’s cap hold in the summer of 2015) will position the Rockets nicely to continue to add significant pieces over the next several years.